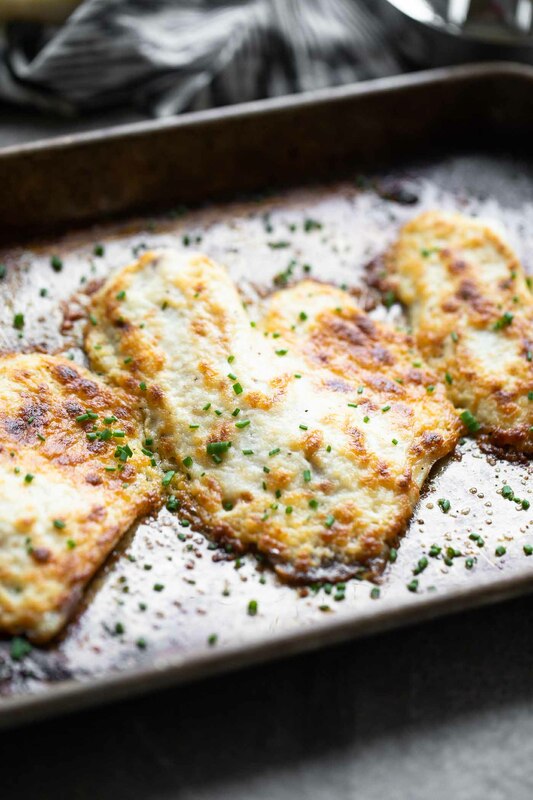 This Easy Parmesan Broiled Tilapia requires ingredients you likely have in your pantry, cooks up super quickly and is the BEST weeknight dinner. Roast some asparagus alongside it and serve with this easy orzo, and you’ve got a wonderful dinner that comes together in under 30 minutes. I’ll admit it. Many of the weeknight dinners I make are what I deem “easy,” but when people ask me what I make, and I tell them, their eyes quickly glaze over and I can tell, they don’t agree. And maybe they’re right. For me, chopping is a way to calm down, others dread it. I thrive on finding ingredients in the the fridge to whip up a quick way to dress my greens, a lot of people find it silly to waste time on making a homemade vinaigrette when you can just buy it at the store. 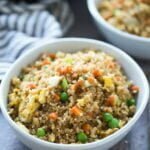 Because I’ve been cooking so long, things that seem quick and easy to me don’t reflect what someone else may think is quick and easy. 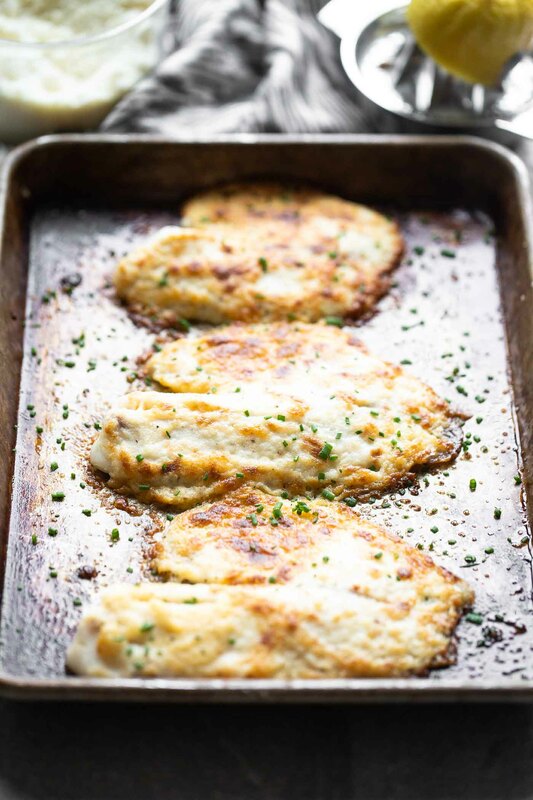 HOWEVER, I can say with 100% certainty, that today’s Easy Parmesan Broiled Tilapia is without a doubt, one of the easiest, quickest, and most delicious ways to get dinner on the table during the week. 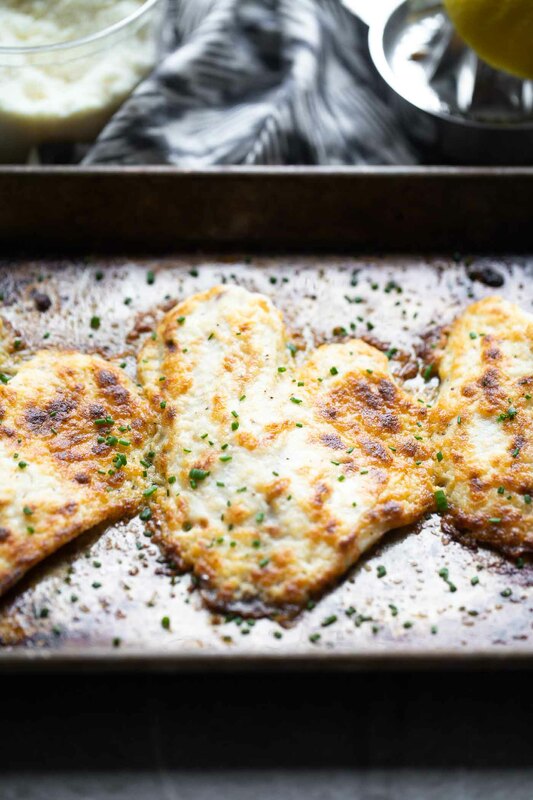 Why Easy Parmesan Broiled Tilapia is perfect for your weeknight dinners. 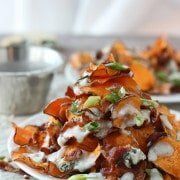 Not only are there just seven ingredients in this recipe, but virtually all of the ingredients are items you can find within your fridge or pantry. Butter, light mayo (full-fat mayo works as well), grated parmesan cheese, lemon juice, hot sauce, dijon mustard, and of course, tilapia are all you need. 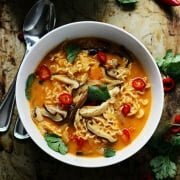 Even if you don’t keep some of these ingredients stocked in your fridge, they’re pretty inexpensive to purchase, and can be used in about a million different ways, so there’s no waste. Win, win. 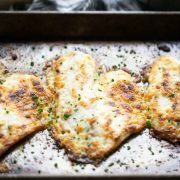 Easy Parmesan Broiled Tilapia only takes 30 minutes (or less!). While the oven preheats, I defrost the tilapia (if you’re using fresh tilapia, obviously you can skip this step), coat a pan with butter and stir together the softened butter (it’s SUPER important the butter is SOFT), mayo, parmesan, lemon juice, hot sauce, and dijon. Make sure to season with plenty of salt and pepper. Next, the tilapia filets are set on the prepared sheet pan, sprinkled generously with salt and pepper and smothered with the parmesan and butter mixture. The pan goes under the broiler until the tops are crusty, golden brown, and the tilapia is cooked through, about 10 minutes. 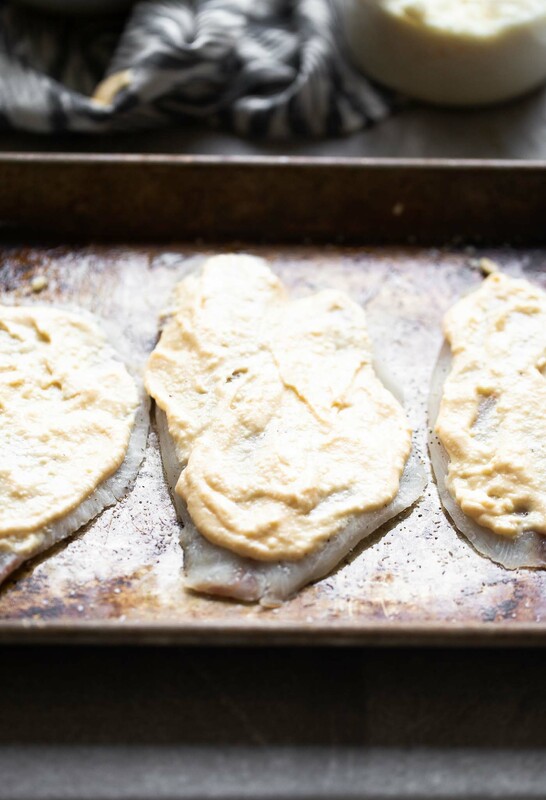 You want to make sure your oven rack is placed in the middle, if you use the top rack, the crust of the tilapia will form before the fish is cooked through, and if you use the bottom, the top won’t get golden brown and crispy. Also, if you use the grated parmesan cheese from the can, this dish will not work. The cheese needs to freshly grated from real parmesan cheese. 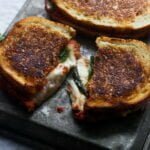 It doesn’t have to be parmigiano reggiano, just normal parmesan cheese. These days, you can find it at pretty much any grocery store, but I know Trader Joe’s sells it for about three bucks. If you want a dinner from start to finish (why wouldn’t you? 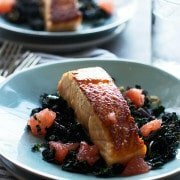 ), you could toss some asparagus with a little bit of olive, salt and pepper, and roast it alongside the fish (they should take about the same about of time). Preheat oven to broil. Place a rack in the medium position. 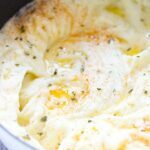 Grease a rimmed baking sheet with butter. 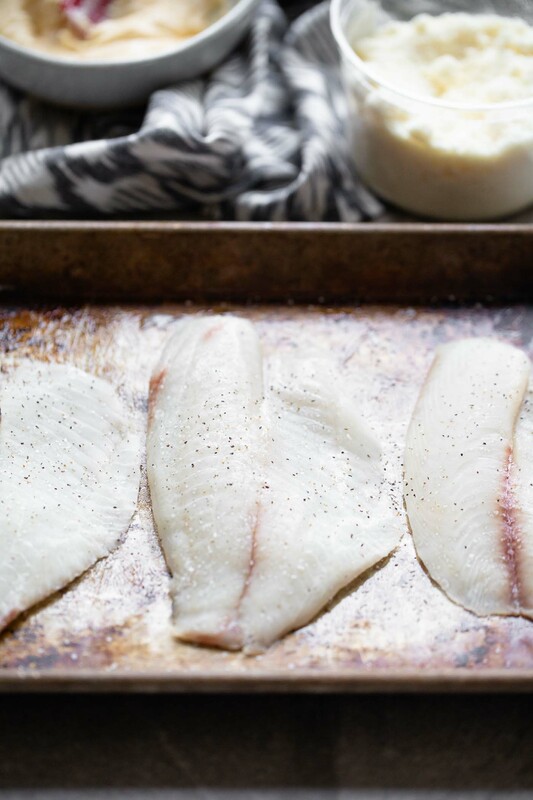 Lay tilapia filets on baking sheet and sprinkle generously with salt and pepper. Broil until topping is golden brown, crispy on the edges and the fish is cooked through, about 12 minutes. If the top starts to become too brown, move the pan to the bottom rack of the oven. Garnish with chopped chive.